Nearly as old as the web itself, web survey packages have grown more sophisticated over the years, to the point where radiology businesses can use them to essentially run their own never-ending focus group online. 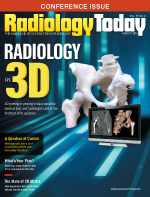 Moreover, given that there's a crowded market of web survey providers, many radiologists find they can satisfy all their surveying needs with the free versions of these solutions without ever upgrading to premium offerings. Such entry-level surveys are great for getting quick feedback on how customers like your new website, what their experience was like with your new staffer, or how they might respond to a new product or service you're thinking of rolling out. And with the premium offerings, you can go well beyond the typical to drill down for very specific insights. "Traditional forms of collecting website experience feedback have included static comment cards that are presented at the same time to every visitor with the same set of required form questions," says Tom Bagnull, content writer for Qualtrics, an online survey provider that often works with radiology groups. "While still useful, this approach focuses on only one segment of the visitor population: those who are still on the site at the time the survey launches and willing to finish the whole survey. Furthermore, these survey forms ask each site visitor the same questions, whether they are relevant to them or not. "In contrast, behavioral and profile-based targeting allows you to engage prospective customers exactly when it is best to engage that particular segment with the questions and experiences that are most relevant," Bagnull says. For example, you may want to reach out to millennials who use mobile devices with specific questions about a particular product category or service you offer. And within the same survey, you may want to reach out to baby boomers with an entirely different set of questions, Bagnull says. "In addition, you may want to intercept any visitor who is idle on a page for more than 30 seconds and ask if they need help finding a product or service," Bagnull says. "This level of flexibility is essential for site owners to capture segment-specific insights and meet the needs of each customer segment." Web surveys are also great for creating an entire community around your radiology website, continually feeding you new insights on how you're doing as a company, and where you should be going—at least as far as your customers' perspectives are concerned. "An insights community will be an extension of your brand and will serve as an engagement piece for your customers," says Dan Fleetwood, president of QuestionPro Communities, another web survey provider that works with radiologists. "Here, they will be empowered to not only share feedback but, through engagement tools, they will feel a real sense of community." Yet another major service web surveys can provide is to give you deep insights into what's going on inside your company's walls in terms of employee satisfaction, employee perception of your company's vision and goals, your employees' take on how your company stacks up against competitors that they can work for, and the like. Chances are, for example, the extensive overhaul of the IT system might be praised to the rafters at official business meetings, but you may get an entirely different perspective on how the implementation of that system is going, if you offer a web survey that employees can participate in anonymously to unload everything they think and feel about the new system. "You don't need a lengthy list of questions to get the information you need," says Rachel Barker, content strategist for Qualtrics. "You just need the right questions." Currently, there are more than 200 web survey providers, according to Capterra, which specializes in advising businesses looking to make software purchases. However, it's easy to get a great overview in terms of what the market is offering by simply looking at the five most popular web software tools on the market. According to a 2015 study by Capterra, those packages are SurveyMonkey, QuestionPro, SurveyGizmo, Fluid Surveys, and Qualtrics. With even the basic version of the top five products—as well as those offered by other service providers—it's possible to design a web survey online; launch it via your website, e-mail, and social media; collect data; and report on results. Many survey products also provide more than one way to ask questions. You may want people to respond on a scale of 1 to 5 on one question, choose from a, b, or c on another question, and input free-form sentences in response to a third question. Higher-end packages also provide options to get more creative with your survey, such as the ability to ask a set of prequalifying questions that steer people down roads to different questionnaires, as highlighted by Bagnull. Another premium feature includes the ability to view a spreadsheet of all survey participants to see who has already responded and who needs to be prodded to return the survey. Still others include a wider selection of graphic themes to design eye-catching surveys, the ability to guard against people looking to spam your survey, the ability to automatically shut down your survey after you've received a certain number of responses, and more. For a complete look at the market—including user reviews of individual packages—check out Capterra's directory of offerings (www.capterra.com/survey-software). • SurveyMonkey (www.surveymonkey.com), free version or $19 to $25 per month: A pioneer in the industry, SurveyMonkey offers graphic templates, supports different question formats, allows segmentation of participants depending on how they answer questions, and comes equipped with questions for typical surveys. It also keeps you updated via e-mail on the number of responses the survey gets each day and provides the ability to filter results based on a data point of your choosing, such as "male responses only" to a survey. • QuestionPro (www.questionpro.com), free version or $12 and up: QuestionPro's free version offers basic surveying tools, a "most common survey questions" library, real-time reports, and optimization for web and mobile. Premium versions add themes, data export, dozens more typical question types, and the ability to manage e-mail lists of a half million or more. • SurveyGizmo (www.surveygizmo.com), free version or $22 per month and up: A mobile-friendly package, SurveyGizmo enables you to design and implement as many surveys as you'd like with the free version, ask as many questions as you'd like, and take in as many responses as you'd like. Premium features include multiple graphic theme choices, survey logic, a typical questions library, custom tools, and analytics. • Fluid Surveys (http://fluidsurveys.com), $100 per month: An enterprise-level package and "big brother" of SurveyMonkey, Fluid Surveys offers a wide variety of survey templates, supports dozens of different question formats, and can be rendered in 64 languages. Fluid Surveys can also be programmed to pop up when someone visits your home page and can be integrated with Dropbox for Business, FreshBooks, Salesforce.com, Mailchimp, Olark, and other online business services. • Qualtrics (www.qualtrics.com), free version or call for premium pricing: Qualtrics allows for lots of customization, offers a bank of typical questions, and enables you to prod via e-mail people who still need to respond to your survey. It also offers Salesforce integration, A/B testing, and company call center integration. — Joe Dysart is an internet speaker and business consultant based in Manhattan, New York. He can be reached via e-mail at joe@joedysart.com, or through his website at www.joedysart.com.